Coming from a disappointing draw last Thursday against América/MG and in the middle of the hurricane that the still undefined “Klebergate” is causing, Palmeiras convincingly beat Santos 3-0 and regained confidence. A loss to Santos and the crises would be a fact, especially since all top teams bagged three points this weekend. Instead, Palmeiras showed tactical discipline, determination and personality. At fourth place with 18 point (same as São Paulo), Palmeiras are one point behind Flamengo and four behind current top dog Corinthians. Watch the highlights below. Winning – and winning convincingly – was not only important in order to keep up with the front bunch. It sent a clear message: Palmeiras do not depend on any single player, nor can Palmeiras be made hostage to the whims of any single player. A few but significant changes to the squad are happening. Adriano Michael Jackson has left, having been sold by Fluminense to the Chinese club Dalian Shide for approximately US$ 3 million. 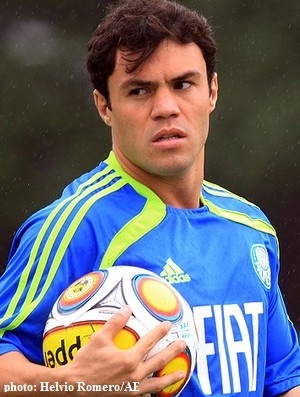 The 23-year-old played a total of 24 games in the Palmeiras jersey and scored six times. 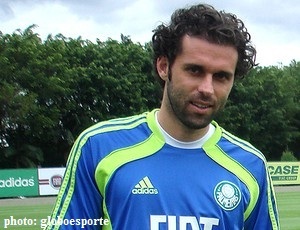 The transfer should render cash also to Palmeiras: some 10% of the total sum. Also Lincoln seems to be packing his bags. The midfielder has had plenty of opportunities in the absence of Valdivia, but not at all corresponded, visibly annoying Scolari. Hopefully a win-win solution is in the pipeline: Lincoln asked Scolari and Palmeiras’ director of football Frizzo not to play this Sunday, as that would have been his seventh game in the Brasileirão this season, rendering him unavailable for transfer to another club. Lincoln is likely negotiating with Fluminense, who recently saw their best midfielder Conca leave for China. If the transfer is confirmed, we could all celebrate: apart from Lincoln’s less than impressive performance on the pitch as of late, he enjoys one of the highest salaries in the squad – apparently close to US$ 170.000. Then there’s Luan. The controversial striker – for a long time heavily criticised by the supporters but now recognised as one of Scolari’s most important strategic pieces – might be leaving. Luan belongs to French Toulouse and his contract with Palmeiras ends on 31 July. Toulouse have already expressed little interest in extending the loan; unless Palmeiras is willing to put US$ 3.7 million on the table to have Luan permanently, the player will have to return to France. Luan himself wants to stay at the Verdão, but things do not look too bright at the moment. Now Kleber. The striker was suffering from an injury to his left thigh but has as of last week been training normally – closely watched by the medical department – and also done parallel muscular practices. All seemed to be in order and a final examination on Friday deemed Kleber fit to play against Santos. Suddenly, on Saturday, he again complained about pains and headed for a private clinic to have them check on his leg. Kleber sustains that the injury is still there and that he’s not fit for play. The script to this soap opera is something we’d expect from the likes of Adriano “the Emperor” [sic]. I wouldn’t dream of comparing the character of the two, but undoubtedly Kleber is on a slippery slope. Palmeiras directors and Scolari are, rightfully, sending signals that some sort of punishment might be in order. Even so, Kleber has the full support of Scolari, who in his captain sees the best striker in the Brasileirão so far and that he indeed deserves a raise. I dare not comment any further, it’s better to wait and see. However, one thing seems clear to me: the longer this drags on, the more remote the chances of a happy ending. For everyone involved. Julio, thanks for you positive feedback! Come back often! Abraço! I just heard Roberto Frizzo’s interview to Jovem Pan on the Kleber Affair. Gotta say that Frizzo went a few points up on my scale – he spoke very well and displayed a lot of calm and collection vis-a-vis such a melee. While trying to remain unbiased, the more I hear the more disappointed I become with Kleber’s attitude. The fact that he used the MD as a smoke screen, faking an injury not to play against Santos, may have been the nail on the coffin of his relationship with the club. I wouln’t be surprised if Kleber is suddenly negotatiated with a foreign club (as a payment for Valdivia’s comeback, maybe?) That would be a face-saving move that might please most parties. Sal, I agree with you completely. Frizzo was perfect and did way better than I’d ever expect. He not only sealed the peace between the two, but also left no doubt in anyone’s mind who committed the misstakes. Kleber came out as an jerk, an idiot. A badly advised idiot. I don’t think he’s on his way out. Don’t think he ever really wanted to, but was pressured to play hardball and failed miserably. Give it a few more weeks and he’ll be back and happy, IF (and I say IF) his image isn’t already scratched too bad with his pals at Mancha Verde. More than anything I believe that his relationship with MV might define how well or not he feels playing for Palmeiras in the future. If he leaves, it’s gotta be for a club outside of Brazil. Again, couldn’t agree more. But I hope he stays and does well. And that he’s learnt a lesson.